I won’t bother you with the same old story that educational principles of more than 100 years ago are still being used in schools today. That has been told a zillion times. 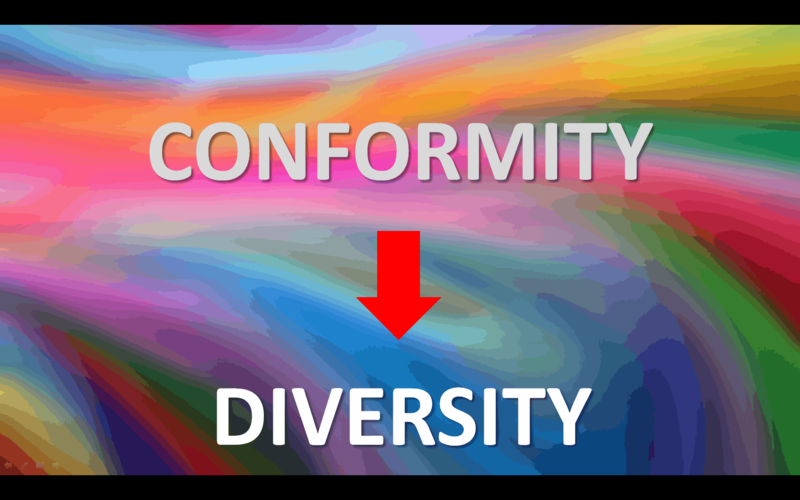 Let’s look ahead and see how schools in my opinion have to shift from conformity to diversity in this post pc era. Isn’t it strange that children are grouped purely based on the year of birth in a classroom and that they stay grouped like that for a whole year. The goal for the teacher is to get them all from A to B within that year. All pupils are treated alike or at least they all have to finish at the same level at the same time. I’m overstating here to make my point. Education has to stop pushing the same content at the same time in the same manner to all pupils at once without taking into account any different learning styles or learning preferences. A classroom is filled with a diversity of personalities to say the least. This starting-point and acting on it is a change. We think it’s normal to eat ‘à la carte’ in our restaurant of choice sitting in a spot we especially reserved on a specific date. My guess it that you most likely ordered another menu than your partner as well. It all seems logical except when it comes to learning. Sure teachers differentiate in the best ways possible but it happens mostly after a block of content has been pushed and tested classical. Not every pupil is ready at that moment and therefore perhaps fails the test and not meet the expectations of teacher and parents. That feeling impacts motivation negative. Learning in the 21st century requires a different, more personal approach on learning. One that starts from the fact that diversity is an opportunity for all those involved and conformity is no longer the higher goal. The child’s well-being is the productive soil on which sowing and harvesting are possible. Personalized learning has per definition the diversity approach as prerequisite. This requires creativity and courage also coming from the government making it possible for schools and teachers to implement this. This is easier said than done. Those who teach were thaught in the conformity spirit. Most classrooms and schools are not suited for the diversity approach. But most of all, the teachers lack good materials to implement this. And with that material available there is a long learning curve to be taken. The shift will not happen overnight but will take some time. The sooner we start with it the better. After all many teachers want to give all opportunities to their pupils. This implicites diversity. Imagine a environment in which the pupil is always in control while exercising and get’s motivated. Gamificiation is also present but not predominant meaning that the pupil is knowing that she or he is learning. A step in that direction is the exercising platform bingel built by VAN IN. It offers a personal learning path based on learning analytics and a smart algorithm. ‘Of course’, you say, ‘you work at VAN IN so it’s easy to state this.’ True but in all honesty I haven’t seen another platform doing better or even matching bingel at this moment. That’s why we built it ourselves from scratch. Started as an exercising platform for doing homework, teachers start using it more and more in the classroom experiencing the full potential of bingel.